All over southern Italy, breadcrumbs were considered the “poor man’s cheese”. Those who couldn’t afford the luxury of the usual grated pecorino—or throwing away stale bread—would sprinkle toasted breadcrumbs over pasta and other dishes. Cucina povera in the literal sense. And yet, as it so often turns out, necessity gave birth to something we can enjoy today, even those of us who don’t need to economize quite that much. Toasted breadcrumbs lend nutty flavor and crunchy texture to dishes, just as appealing in their own way as the finest cheese. Pasta with breadcrumbs, or pasta con la mollica, is a specialty of Puglia, Calabria and perhaps most famously, Sicily, where they call it pasta ca’ muddicca. Spaghetti is the most common choice for the pasta, but in parts of Puglia they prefer mafaldine, a ribbon-shaped pasta with ruffled edges. Pasta con la mollica is a favorite there for la festa di san Giuseppe, or St. Joseph’s Day, on March 19, which is Father’s Day in Italy. As you may remember, Joseph was a carpenter, and they say breadcrumbs resemble the sawdust you’d find in a carpenter’s shop. Hence you’ll sometime see this dish called pasta di san Giuseppe or St. Joseph’s pasta. In a large sauté pan or skillet, sauté the garlic, red pepper flakes and anchovies in abundant olive oil over gentle heat, until the garlic barely begins to brown. Turn off the heat and add the minced parsley. In a separate skillet, sauté the breadcrumbs in enough olive oil to moisten them, again over gentle heat, until the breadcrumbs have lightly toasted. (Take care not to let them burn, they cook quickly once the pan is hot.) Turn off the heat. Season with a pinch of salt if you like. Boil the pasta in well salted water. When the pasta is al dente, drain and transfer it to the pan with the garlic and anchovy sauce, mixing it well over low heat. When the pasta is well coated and any water clinging to it has evaporated, add about half the toasted breadcrumbs and mix well. 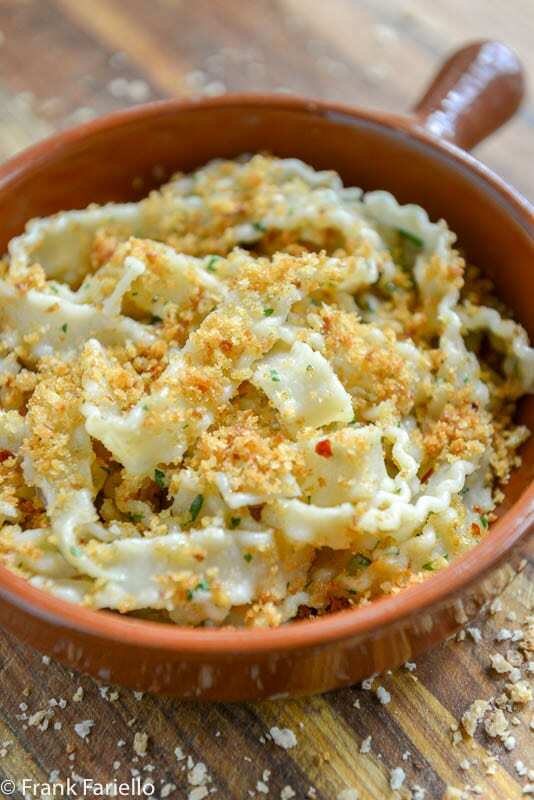 Serve the pasta right away, topped with the remaining breadcrumbs. As mentioned, you can make this dish with spaghetti or indeed any long pasta. But I do agree that mafaldine are a particularly nice choice. Those little ruffles grab the breadcrumb dressing quite nicely. It’s not the easiest pasta shape to find, but mafaldine are sold in Italian food shops or, of course, online. There’s an interesting if tragic backstory to this pasta shape, named after an Italian princess who married a German prince and wound up dying at Buchenwald. You can read about it here. Many if not most recipes for pasta con la mollica call for mixing all the breadcrumbs into the pasta. But I like to hold back half and using it as a topping. This way, each diner can mix it into the pasta themselves (or not). The breadcrumb topping gives the dish visual appeal, and it keeps the breadcrumbs nice and crispy. The parsley is optional, but I rather like the flavor and of color that it lends to the dish. Some recipes call for a bit of tomato paste mixed into the sauce. In some recipes, a bit of grated caciocavallo cheese gets sprinkled on top along with the breadcrumbs. (No longer a poor man’s dish, I guess.) In a few recipes, the anchovies are added to the breadcrumbs rather than to the garlic and oil sauce. The anchovies are mostly there only to add a bit of umami, so if you don’t care for anchovies or are eating vegan, you can omit them. On other other hand, if you really like them, there’s nothing wrong with going to town. If you do, you can call your dish pasta con acciughe e mollica, or Pasta with Anchovies and Breadcrumbs. According to some sources, the anchovies were originally fresh sardines, a nice sounding choice if you have access to them. Thank you for yet another delicious recipe and food history lesson! My grandfather and his family emigrated from Sicily to New York in the early 1900s. One of the meals my great-grandmother prepared often, which has become a family staple that even my sons now prepare (although we now roast the cauliflower) was what we kids called “spaghetti and cauliflower”. She would par boil the cauliflower, then sauté it with a little garlic, anchovy and parsley. Add the spaghetti and top it with a mixture of breadcrumbs/Parmesan cheese. As a kid, I thought the breadcrumb topping was very fancy – but know I now the reason why she did that! Grazie! It looks so scrumptious ! can’t wait to make some for myself. These humble dishes are so often the best! Your photographs look so fantastic that I’m craving a dish of this pasta, and I just finished dinner! I hadn’t realized the connection between St. Joseph’s vacation, saw dust and breadcrumbs; thank you for that historical reference. The transition fro Cucina Povera to a popular presence at today’s Italian restaurants always amuses me. Those toasted bits of bread on top of a pasta dish really give it both substance and the nutty flavor you described. Mafaldine pasta is so pretty and I love when those ruffles capture bits of other delicious ingredients — like those crispy breadcrumbs. Delicious. Such bits of interesting history I’ve learned in your post today. Thanks so much, Valentina! It really is one of the loveliest pasta shapes. We always have spaghetti with breadcrumbs as one of our courses on Christmas Eve. Love the photos but now I’m hungry. Well, there’s an easy solution to your hunger… lol! Thanks for stopping by, Karen! I’ve never made this dish, but I know I would love the flavors here and the crunch of those bread crumbs. Happy St. Joseph’s Day and thanks for posting this traditional regional recipe. Thanks, Linda! I think you would like this one. What a sad time that was in history, it’s nice that something good came out of it with this interesting pasta shape. Fortunately, we have a fantastic cheese shop that carries an immense variety of authentic Italian pasta so I’m sure to find this shape there. The Hungarians use breadcrumbs as toppings for many dishes, I never associated it with a poor man’s ingredient but it certainly makes sense. Interesting about the use of breadcrumbs in Hungarian cookery. I don’t know much about it—other than goulasch, of course—but I’ve always been curious to learn more about it. What a fun story behind St. Joseph’s pasta! I always love hearing the stories behind some of our favorite recipes. I absolutely love pasta, and this sounds like a super easy and flavorful dish. The concept of toasted breadcrumbs as a topping sounds quite tasty. Quick and easy, but not lacking in the flavor department at all! Not at all, David. This one’s a winner, in my opinion! I would never omit the anchovies! Delicious, Frank. So simple but so good. Pasta con la mollica di pane is a commom recipe in Italy. I make pici with breadcrumbs. The addition anchovy makes this dish very tasty. I will try it! Funnily enough I actually didn’t have it when I was in Sicily last summer… next time! Have made this cucina povera dish without knowing the story . . .yours looks wondrously appetizing . . . the pasta shape is one I have not used but that can be remedied . . .
It’s a nice shape, in particular for this dressing, Eha. Worth looking out for! Always in for vintage frugal dishes… pasta prepared this way is on our menu once a month; even gnocchi prepared this way are so tasteful to both of us … Thank you and have a great week end. Gnocchi sounds nice, I’ll have to try it some time! Definitely worth a try, John! Thanks for stopping by. Hi, Frank! Great minds must think alike. We were planing on putting out our Pasta con la mollica on Tuesday. We wanted to celebrate Father’s Day with san Giuseppe. We’re tired of St. Patrick getting all the publicity!! 😀 Buon weekend! Thanks, Marisa Franca. And enjoy your San Giuseppe! And thanks for stopping by, Michele! Frank, I love simple pasta dishes that hero the pasta. Mafaldine is a lovely shaped pasta and one I really enjoy, so it would be my choice when I prepare your Pasta con la mollica. Anchovies, absolutely. Thanks for sharing another great pasta dish.